Join San Isabel Land Protection Trust today to conserve land while there is still time. Becoming a member means you are committed to protecting working ranches and farms, natural areas, water and wildlife corridors - for our health, wealth and enjoyment, now and for future generations. Protecting working ranches and farms, valuable wildlife habitat, scenic views, water and more. Stewardship of nearly 40,000 acres, 174 water rights and 61 miles of stream frontage. Community education and outreach programs. The satisfaction of helping to protect the beauty and health of our land and community. Acknowledgement of your tax-deductible contribution and recognition in our newsletter. Invitations to special events, including our annual member appreciation event. Up-to-date regional conservation news and other exclusive member announcements. If you have questions about San Isabel Land Protection Trust membership, please contact us at 719.783.3018. 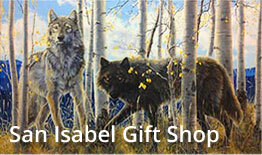 San Isabel Land Protection Trust is a 501(c)3 organization and contributions are tax deductible. Without the support and hard work of our generous volunteers and members, San Isabel Land Protection Trust would not be where we are today! We’re always looking for help! San Isabel Land Protection Trust gratefully accepts gifts of land or other real property. Such gifts are carefully evaluated in terms of formal land protection or resale to be used to further our mission. For eligible purchases, the AmazonSmile Foundation will donate 0.5 percent of the purchase price to San Isabel Land Protection Trust. Please click the link below before shopping at Amazon, or start your shopping at smile.amazon.com and select San Isabel Land Protection Trust. Giving Assistant shoppers can earn cash back and find the latest coupon codes from more than 3,000 brands. You can then donate a portion of your cash back earnings to San Isabel. To learn more, go to givingassistant.org.